The Bank of Canada will publish the results of its recent review of interest rates on Wednesday, and there is plenty of speculation Governor Stephen Poloz will use the opportunity to raise the bank’s overnight rate, which would increase costs for everything from mortgages to business loans. The speculation is largely based on strong GDP performance for the first quarter of 2017, though one good quarter does not a year make. Actually, with the interest rate at a historic low of 0.5%—pedal to the metal for the BoC—it is surprising how slowly the economy is moving. The bank is supposed to be able to juice growth by dropping rates. That’s clearly not happening, here or in other parts of the world. Negative interest rates in Europe have been equally ineffective at improving GDP. However, the Bank of Canada doesn’t actually target economic growth; it targets inflation and nothing more. It wants inflation to run at between 1% and 3%,with all other concerns—from ballooning household debt to employment rates—being secondary to this overriding concern. The bank uses three special inflation measures (CPI-Common, CPI-Median and CPI-trim, which you can read all about here) that attempt to remove the more volatile aspects of the Total Consumer Price Index. I’ve averaged all three together in the chart below to simplify things. But here’s the trouble. Despite a decent first quarter of GDP growth, the Bank of Canada’s preferred inflation measures are averaging an 18-year low as of May 2017! You’d have to go back to March 1999 to get a lower average inflation rate. Ever since 2010, the bank’s key inflation measures have been nowhere near 3%, or the top of their stated range. 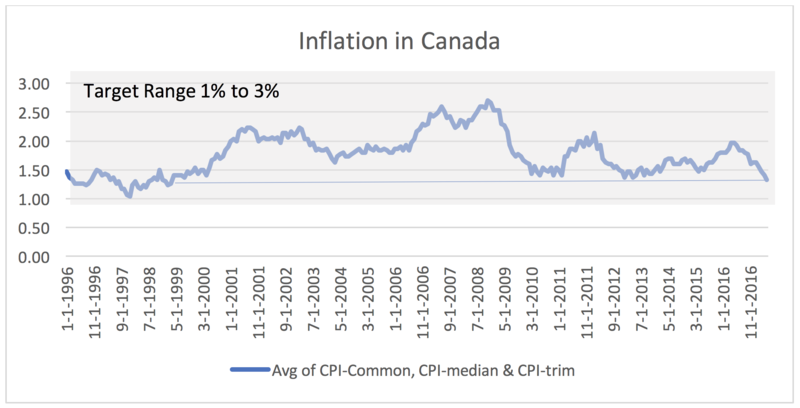 In fact, the average inflation rate since 2010 has been only 1.6%, much closer to the bottom of the range than the top. The bank’s inflation measures have been falling steadily over the past 12 months. If anything, the rate of inflation is too low. But there’s a hidden issue afoot here. Inflation is a sanitized way of talking about wage gains, which are one of its primary components. When the Bank of Canada raises interest rates one of the primary impacts is that it reduces wage gains for working Canadians. As rates rise, businesses cut back, lay some people off and make workers afraid of asking for a raise, hence less inflation. The Bank of Canada inflation range is in effect a ceiling on the raises Canadian workers can hope to get in a year. Just as inflation has been low for the past several years, so have wage gains. 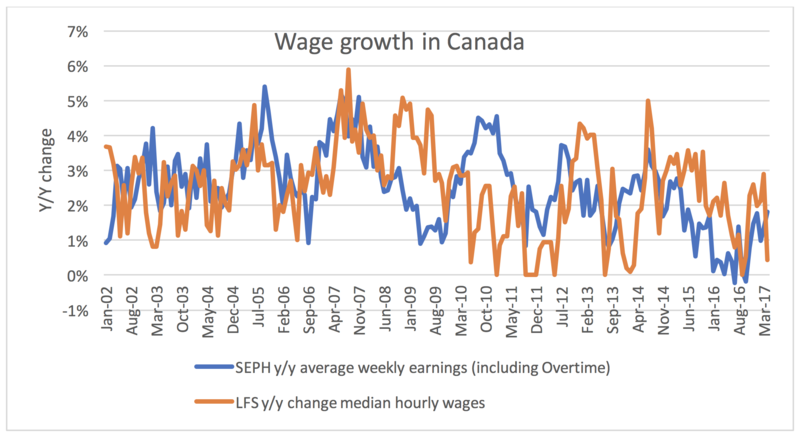 The survey of wages from the business side (Statistics Canada’s Survey of Employment, Payroll and Hours) recorded a decline in year-over-year weekly earnings in 2016, a first in 15 years of measurements. The survey of wages from the employees’ perspective (the Labour Force Survey) recorded 0% growth year over year in hourly wages as recently as September 2016. The April and May 2017 year-over-year hourly wage gains were an abysmal 0.4% and 0.6% respectively. For all of the 2000s it was exceedingly rare to see a month where hourly wages grew less than 1% year to year. But after 2010 it has become commonplace. There has been plenty of talk (including from me) about rising mortgage debt and the dangers of high private sector debt in general. One of the possible policy solutions is certainly higher interest rates. However, the knock-on effects from such a move, in terms of further lowering already low wage gains, are significant. Targeted taxation is a more effective way of reducing asset price inflation. A foreign buyers tax has shown some early promise. Other measures to rein in the housing market might include a speculators tax, a lifetime cap on the principle residence tax exemption, and a higher capital gains rate in general. Targeted tax measures have the benefit of controlling real estate prices, and therefore mortgage debt, without the downside of driving down wage gains. GDP growth was decent over the past few months, sure, but it hasn’t translated into real raises (and therefore inflation). Nudging the Bank of Canada’s overnight rate up a notch will only further depress both. A better approach is to let our economy grow for a change and let employers work harder to hire new employees, which would ultimately result in higher wages. Given the terrible growth in wages since 2010, we’ve got some catching up to do. David Macdonald is a senior economist with the Canadian Centre for Policy Alternatives. Follow him on Twitter @DavicMacCnd.